Importance. -- In forest stands these diseases are of minor importance on oak (alternate host). However, they affect the aesthetic value of shade trees and ornamentals. Fusiform rust on pine (primary host) is the most important disease of pine in the Southeast, while eastern gall rust is generally a minor pest. Identifying the Fungi (figure 70). 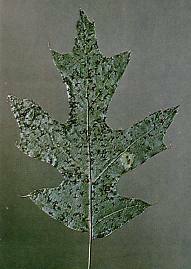 -- Both fungi develop brown, bristly spine-like structures on the underside of the oak leaf. Identifying the Injury. -- Small yellow spots develop on the leaf surfaces in spring. Some defoliation may occur. Red, water and willow oaks are primarily affected. White oaks are seldom affected. Biology. -- Leaf rusts require two hosts to complete their life cycle. Fungus spores (aeciospores) produced on pine galls are windblown and infect young oak leaves. 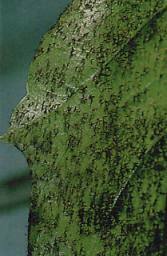 Spores (urediospores) are produced on the oak leaf which reinfect oak. Spiny-like hairs (telial columns) on the lower oak leaf surface release teliospores which produce another spore stage (basidiospore) that infects pine. This infection results in a gall with aeciospores, and the cycle is completed. Control. -- No control needed on oaks as the damage is minor. Figure 70. -- Two views of rust telial columns on oak leaves.